As of November 2, 2009, Turbine's Asheron's Call has been running for 10 straight years. Today marks the 10th anniversary of Turbine's MMORPG Asheron's Call. Back in November of 1999, there was actually some competition in the MMOG space, rather than one big player (World of Warcraft) hovering over everyone else. 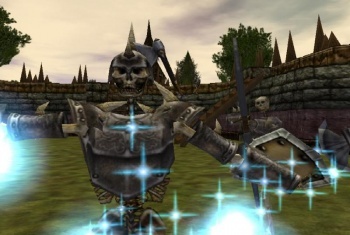 Asheron's Call differentiated itself from games like Everquest by shunning the use of typical creatures such as goblins and ogres, instead going with more unique abominations. Asheron's Call also bucked other MMOG conventions by making level not quite as important in combat, with its allegiance system, and with an originally very different (and somewhat difficult) magic discovery system. According to Craig Alexander, Vice President of Product Development at Turbine, Asheron's Call laid the foundation for Turbine, which has also developed the now free-to-play Dungeons & Dragons Online and the subscription-based Lord of the Rings Online. When you consider that Ultima Online and Everquest have already celebrated their 10th anniversaries (in Ultima Online's case its 12th), this may not seem like a huge accomplishment. But, to keep an MMOG up and running for that long does take dedication, and to keep it profitable must be a challenge as well. Many more recent MMOGs have already bitten the dust, including Tabula Rasa, Auto Assault, and, well even Turbine's very own Asheron's Call 2. Special events within the world of Asheron's Call will be running throughout the day, which should see the revival of "loved and feared" signature lore characters. If you once played Asheron's Call, now might be a good time to log back in for a month to see how things are running. The game may be hard to find on some store shelves today, but has definitely cemented itself as an important member of MMORPG history by surviving for so long. To find out more about Asheron's Call, or to check out a 14-day trial, visit the game's official website.